Ghost hunting isn't just about a willingness to get sucked into a hell dimension with a grin on your face. It's an old profession that requires many different kinds of gadgets and weird devices. Check out the tools that ghostbusters have carried around, both yesterday and today. Although now people eagerly go on ghost hunting tours, and towns advertise themselves as 'the most haunted place in the state/county/country/continent,' there were times when people weren't so thrilled to have ghosts around. In the days before bright electric lights and houses built less than twenty years ago, the attitude towards ghosts was "Get it out! Get it out! Prithee, get it the hell out!" This kind of hunt isn't meant to marvel at ghosts so much as its meant to sandblast them out of a house. Once the ghost was located, it was time to bring in the tools to get it out. Generally this meant one (1) bona fide religious authority who could chant at it or say other holy things until it left. With that religious person generally came one (1) bag of salt. Evil spirits were considered impure, and so pure 'elements' like salt could drive them from a place. Also there generally came sundry (?) pieces of iron, since iron was considered to be a cure-all for bad spirits of every kind from fairies to ghosts. It could be placed in some rooms or driven through some objects, to purify them. Hopefully none of them were living. If none of those things worked out, people often tried turning the tables on ghosts; creeping them out so much that they wanted to leave. Witches bowls were common spirit-fighting implements. People made a crude ceramic bowl and filled it with the hair, teeth, spit, and blood, (and often urine), of everyone in the house. They then hid it above the door or buried it under the floorboards near the front entrance. The ghosts, presumably, were so worried that they'd have to see people peeing into their own hair every day that they went off to find a nice crossroads to haunt. The Victorian era was when ghost hunting started involving more documentation. Now, instead of third-hand accounts given from peasants with pitchforks to the local lord to the local priest, people could set up a camera and document ghosts themselves. In this era, it wasn't really about getting ghosts out of the house, or even just taking a look at them, it was about communicating with them, and documenting that you did. Priorities had changed, and so instead of a religious person to ban a ghost from a house, they wanted a spiritualist who knew how to get into communication with the dead as efficiently as possible. Terminology had also changed. People would still look through pieces of glass to see ghosts, but they called them 'tesseracts,' a term coined by Charles Howard Hinton, who sold representations of 'four dimensional cubes,'as magical objects. After seeing the ghost, it was all about snapping a photo. The problem was, at the time photography was a long complicated process that exposed each print to several sets of chemicals. This lead to unexplained light spots, shadows, orbs faster than people could say, "It's been 'shopped!" Since photography was still in its infancy, every new effect was a special effect. If a ghost photographer had an assistant walk through the background of a slow exposure, there was a spectral form. If they put some radium on a screen behind a person's head, and then lowered the lights just before taking the picture, there was a strange light. Other people left off the practical effects and just sketched ghost portraits right into the finished photograph. But the really big thing at the time was 'ectoplasm.' Finding ghosts meant finding a substance that made them, and ectoplasm was it. The problem was, ectoplasm could be anything, from home-made goop to strands of cloth. One of the most famous mediums at the time, Helen Duncan, famously regurgitated ectoplasm during her seances. Photographs, and some eyewitness testimony, show that it was obviously partially-digested cheesecloth. Still, many ghost hunters had a collecting set and chemistry equipment on hand to mop up and test ectoplasm, should it turn up. Current ghost hunters have a different approach. It's called, "measure everything, and hope you find a ghost in there somewhere." And you can do it for the low, low price of whatever a ghost hunting site decides to charge for the equipment! First off you'll need the traditional ghost hunting equipment; cameras, cameras, cameras. You'll need digital and film cameras, video cameras, and cameras on motion sensors to put around the house and catch footage of unwary ghosts. Or raccoons. Or unwary ghost raccoons. You'll also need audio recorders, and programs that boost background signals so you can edit out the sound of you and your friends saying, "Do you hear something?" You'll also probably want one camera that's broken and just recording static, in case that helps. Then you'll need to document the conditions that the ghosts like to haunt in, so if need be you can duplicate them and make a little ghost terrarium and raise ghost hamsters. You'll need an ultra sensitive temperature gauge. (This is an indispensable device, since no matter what it's used as an indicator of ghosts. You feel a sudden chill? The temperature gauge confirms it! It's proof of ghosts! You feel a chill and the temperature gauge doesn't confirm it? It must be ghosts causing the discrepancy!) You'll also need a Geiger Counter, for ghosts of nuclear fall-out, I guess. Ion meters sense negative ions, the most ghostly kind of ion. And just to round out the conditions, you'll want an infrasound monitor. Infrasound is ultra-low-frequency sound waves that are said to cause headaches or make people hear sudden low booming noises. 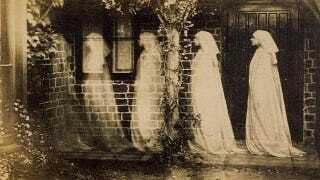 Whether these are the result of ghosts or 'ghosts' are a result of them has been debated over the years. In the end, though, you'll need the gold standard of ghost-measuring devices; an electromagnetic field detector. Some people use something cheap, like a compass, but there are detectors that monitor everything from the strength of the field to any minute fluctuations. It's been shown that strong electromagnetic fields are associated with people seeing and hearing ghosts. Whether it's a trick of physics on the mind or a spiritual and physical correlation depends on whether or not you are, for example, selling the ovilus. The ovilus is the most modern ghost hunting tool on the market. It is pre-programmed with certain words and phrases, and with the ability to combine sounds into more words. It measures the electromagnetic fluctuations in any room and translates those flutterings to words which it displays. In this way, people can have conversations with ghosts, or just pick up on what they're saying. The latest model came out this year. As for Ouija boards, well, take one to a ghost hunt and people would laugh contemptuously at you, if they didn't pity you so much. Although there were letter boards in the past that spelled out mystical communications, the Ouija board started off as something that wasn't supernatural at all. It was just a fun board game in which groups of people spelled out words. It was when people started getting scary and threatening messages that it fell out of favor. (The inclusion of a board in The Exorcist didn't help.) Apparently, contacting the spirit world with a Ouija board is a little like contacting a message saying that you like to kick your cat, while giving them your home address. It's just asking for trouble. If you want the classy ghosts, you'll have to come at them with thousands of dollars worth of electronics equipment, not just a board and a pointer. That'll leave you talking to a troll. A ghost troll. Via Discovery, History.com, Ghost Hunting 101, Paranormal People, and Helen Duncan.org.